Posted on October 20, 2015 at 2:27 am. If you’re a regular at Roxy Palace Casino, then you’re in luck as they’ve rolled out three new slots to go with their extensive catalogue. Including Scary Friends, Titans of the Sun – Hyperion, and Titans of the Sun -Theia, from Microgaming, you’ll be spoiled for choice at the reputable online casino. If you haven’t signed up to www.RoxyPalace.com yet, opt in for their welcome package where you can get up to $350 matched by 100%. With Halloween fast approaching it’s only fitting we get in the mood with this new slot from the popular collaboration between Rabcat and Microgaming. However the symbols aren’t really that scary more just weird in a cute way – similar to the beloved characters from Monsters Inc. 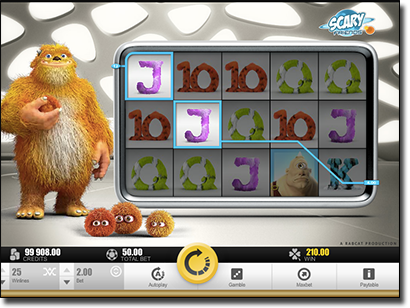 While Rabcat is known for their beautiful 3D graphics that fill the reels, they have actually kept it quite simple on this slot, but visually it is still crystal clear – thanks to the Quickfire platform. There are four different monsters, as well as a huge, fluffy, orange monster that hangs out next the reels, along with little balls of hair with huge eyes that jump around on a win and poke out while you’re spinning. The orange monster also acts at the Wild, which substitutes for every symbol except the Scatter. You can also win from five to 14 free spins by spinning the Free Spins symbol at least three times. There is also another bonus feature where you are able to choose from four monsters who will then race against the other three and if it places first, second or third you will win a substantial payout, with first place scoring you up to 25,000 coins. Simply spin three Bonus symbols to activate. On top of all this there is a 40,000 coins jackpot on offer. All you have to do is spin five Wild symbols and you will bag it. Microgaming have also released two new slots with similar themes, both now available at Roxy Palace. Known as Titans of the Sun – Hyperion, and Titans of the Sun – Theia, the two slots are almost exact replicas, besides a few minor differences that may just see you preferring one over the other. 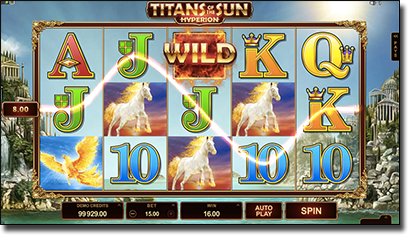 Based on a mythological God, Hyperion, and a mythological Goddess, Theia, both offer 15 paylines across 5 reels and include a unique Mystery Symbols feature where any symbol can change into another symbol to complete a winning combination. There’s 15 free spins available on each slot, though the Theia version doesn’t allow re-triggers during the feature but does offer a 2x multiplier for every win, while the Hyperion version doesn’t offer any multipliers but the free spins can be re-triggered. Additionally, Hyperion has a bigger jackpot on offer at 750,000 coins, while Theia offers 600,000 coins. The Hyperion slot is also said to pay out more regularly with larger wins, as per the paytable. You can play any of these pokies on your desktop devices, laptop, smartphone or tablet at Roxy Palace now.